Gulf Arab nations need more time to fine-tune plans for a possible union, the Saudi foreign minister has said. Speaking at a summit in Riyadh, Prince Saud al-Faisal said postponing the creation of a union aimed to "bring all the members and not only two". He was referring to Bahrain and Saudi Arabia, two of the six members of the Gulf Co-operation Council (GCC). The Saudi-Bahrain union is seen as a first move aimed at countering Shia-majority, and regional rival, Iran. While the exact nature of such union is unclear, Bahrain's Information Minister Samira Rajab said it could follow European Union model. 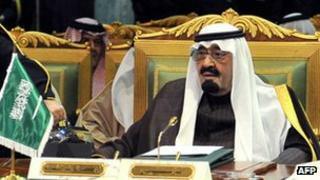 The plan is the brainchild of the Saudi monarch, King Abdullah, who chaired the meeting in the Saudi capital. Bahrain has seen political protests and unrest since February 2011, led largely by the majority Shia population demanding greater democracy and an end to what they say is discrimination by the Sunni Muslim royal family. Amnesty International says 60 people have been killed since the protests began, including members of the security services. The idea of closer union between some or all of the six Arab Gulf states that make up the GCC is not new but recent events in the region have prompted leaders in Saudi Arabia, Bahrain and possibly Qatar to step up their efforts at union. Gulf Arab leaders worry about Iran, even without a nuclear weapon. The UAE is in dispute with it over three tiny islands, Bahrain believes Iran is encouraging Shia protest against its Sunni monarchy - especially in the wake of the Arab Spring - and Saudi Arabia suspects it of fomenting unrest amongst the Shia of Eastern province. But some Gulf Arab citizens worry about just what such a union would entail. Will regional giant Saudi Arabia, for example, where women are forbidden to drive, be imposing some of its more conservative policies on its smaller Gulf neighbours? Hundreds of people have been arrested, scores tortured in jail and convicted in front of military tribunals, and more than 4,000 people were summarily sacked from their jobs. The initial protests focused on Pearl Roundabout in the capital Manama. These were ended when troops from Saudi Arabia, a regional heavyweight, and other GCC countries entered Bahrain in March 2011. Saudi Arabia has seen a number of smaller protests by Shia demonstrators in its Eastern Province. Bahrain's King Hamad has tried to address some of the protesters' demands by announcing constitutional reforms intended to lead to greater accountability. But the opposition, as well as human rights groups, say the promises are empty and that a severe crackdown on dissent is continuing.